In our ongoing effort here at FASLANYC to bring you the most idiosyncratic and exciting developments in the realm of landscape, we recently dispatched our very own Don Roman de la Mancha to Dixie to find out if anything noteworthy is going on down there. Judging by the recent revelations emanating from the southland, it appears that they also have a James Corner-fixation, Elizabeth Mossop’s work with Vietnamese immigrants notwithstanding. And that is all well and good. But, we wanted DRDLM to find out what else was happening. The following is what we got back; it seems to consist of an ragged interview between DRDLM and the proprietor of a bizarre little outpost of a landscape studio. The studio is called LuchaLibreLandscape, a self-proclaimed “Landscape Studio, Bait Store, and Bike Shop” run by a genteel southerner known as “H. Willis Montcrief”. DRDLM: Bueno, la verdad es que me parece bien raro que Ud. trata de mantener algun tipo de negocio asi. Que le inspiro a ponerse al camino ese? HWM: I’ve been working as a landscape architect for a few decades and noticed that the most interesting folks, in my opinion, always had disparate interests and there was a constant tension between those interests and the practice of landscape. I also noticed that most landscape practices are boring and self-important, and that the seasonal nature of the work was not accounted for in the business model. Well, I started a-thinkin’; is there a way to harness that tension, ropin’ these interests and skills into new relationships? Is there a way they can feed off one another, allow for a bit more experimentation and research, and create a more resilient business model, decouplin’ it a bit from that there development cycle? DRDLM: Interesante. Me llama la atencion eso del “desjuntarse un poco del ciclo del desarollo. Como comenzo ese esfuerzo? HWM: I just a-realized that not so much design work goes on in the summer- that’s when they build more stuff, see? That’s a good time to get out, check things out, see how the buildin’s going, do a little research, a little observation, some field experiments, stuff like that. Well, you see, the best way to do that is by bike. DRDLM: Entonces te pusiste a levantar un negocio de reparacion de bicicletas? HWM: Well, I quit my old job. The projects were good but the methodology was a bore. It was a bizarre combination of darin’ individualism and insecure conservatism that you get with a designer-as-auteur. The boss had this methodology and you were just ‘sposed to do that. That’s just the way some folks with power get, even if it’s just a little landscape studio. Hemingway talked about it in that piece “The Malady of Power”. Anyways, I realized that won’t no good for me after a few years and first chance I had, I took off outta there like a scalded dawg. Well, round about that time I got a spot helpin’ cousin Chet in ‘is bike shop on the corner in town, so I was doin’ that for a while. But I still liked landscape. You see, we got all these things goin’ on right now- economic crisis, labor crisis, infrastructure crisis, post-industrial environmental crisis, and social justice issues. And I think landscape offers the context within which to get at all of these to some degree. The landscape is big man; it forms us and we form it. DRDLM: Asi quisieras empezar de vuelta con el trabajo de hacer proyectos paisajisticas? HWM: Well, I’m into the de-mystification of the landscape. I mean, there is room for a specialist doing specialist-things that only special people understand, like Alan Berger and them guys. But you see, that’s really kinda boring to regular people- it’s elitist, like Hollywood, or Washington. So then I was watchin’ this TED talk by that dude Dave Eggers. Now, he’s a pretty cool writer, but he also started up this thing in San Francisco called 826 Valencia. They got a bunch of writers together and formed a little publishing house and a tutoring center for neighborhood kids, the thinkin’ bein’ that the writers would be good at helpin’ with homework and stuff. Well, they didn’t get many folks through there- no kids want to go to a “homework place”, and writers can be kinda self-important and esoteric in their approach, ya know? So, the last thing they did was open up a Pirate Supply Store. Now this thing was weird and goofy but it was fun, idiosyncratic, and it attracted kids and kinda humanized or demystified the tutorin’ center. I thought that was pretty cool. Suddenly, kids can get help with stuff, they can buy or look at pirate stuff, writers are all together sharpenin’ one another, and gettin’ inspiration from kids learnin’. Then come to find out the pirate store was payin’ for itself! So now they got this business, and they make a little bit writin’ and a little bit sellin’ things and get some grants and community money sometimes for the tutorin’. Now that might not be real lucrative, but it also isn’t totally dependent on writers sellin’ articles to Esquire or whatever. DRDLM: Y con ese modelo pensado, te pusiste a crear un negocio que combinaba sus intereses de forma simbiotico como el 826 Valencia. Como fue eso en los primeros dias, y con quien lo hiciste? HWM: I started thinking; people bike most in the summer and most landscape design, at least what I was doin’, happened in the winter. And like Hemingway said [I read a lotta Hemingway; that and sports news], “it is by riding a bicycle that you learn the contours of a country best.” So, I got a garage on the street level and divided it in half. On one side you got all these cool process models, big drawings, and some computers and things- it’s cool and messy but pretty clean and white bread and antiseptic, like a typical design office. Then on the other half, we put a little bike shop. So suddenly you get this real incongruous visual experience that’s just opened right out onto the street- it’s kinda striking, and interesting. And that’s the same experience you have when you go there, either to work or as a customer. There’s this stimulation happenin’. Kids coming in for their bikes start asking about the models and drawings and such, and then you get a little chance to teach. Clients for landscape projects get to see where our values are. If they think it’s unprofessional ’cause it’s not a regular office, tough nuts. Sometimes we’ll take clients on bike rides to show ’em examples of design experiences or elements we’re proposin’, too. It all starts workin’ together, even if it’s a bit schizophrenic. DRDLM: Y como es esa tienda de bicicletas? Como funciona, y que venden/hacen? Con que laburo estan cuando esta abierto? HWM: The bike shop is mostly focused on gettin’ bikes rollin’, especially for kids. We can order any bike or part, but we focus on a lot of cheap, simple stuff- not too many carbon bikes and Dura Ace here. The reason bein’ is twofold; we want it accessible to folks, not just aficionados ’cause we want folks to ride bikes; and we also aren’t bike specialists so we don’t know how to work on all that high-falootin’ stuff. We mostly do landscape, and just run the bike shop in the down time. But you see, the down time for a design studio tends to be in the summer, when it’s more fun to be out ‘n about on a bike, or helpin’ the locals put together a bike. Occasionally we’ll work with a school to put together a big bike trip or somethin’, take the kids out to the lake on the edge of town or the river goin’ through the city. We go with their science teacher, and there we get a chance to help teach ’em a bit about landscape stuff, and how we as designers are goin’ about adressin’ all them problems I was talkin’ ’bout earlier, stuff like using live stakes for phytoremediation, how to protect or enhance riparian ecologies, or the best place to put a structure in a delicate area; but a cool structure like a fort, or a fishin’ pier, not a modernist house or whatever. Sometimes it’s cool. And sometimes it’s not. But it’s interesting. 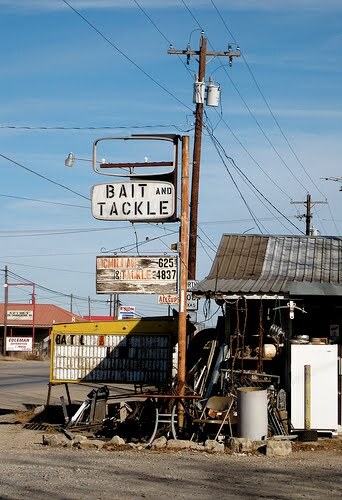 From there, it won’t a big jump to start up the bait shop. See, we like fishin, too. An’ out back we got a little experiment yard; a place where we let certain materials weather or try out certain plantin’s or construction methods. Well, we know folks like to head out to the lake or the river for fishin’, and you tend to fish early in the mornin’ or at dusk when we’re not really workin’ in the studio. And you go fishin’ in the landscape- so there’s an appreciation already there. So we cater to them folks a bit too; we put in a few cricket cages and a minnow tank out back and there they see all the experiments and stuff and we’ll show ’em drawings of a project sometimes, since a lot of projects relate to water quality and reclamation. They just naturally care about that, so sometimes somethin’ comes outta that. It’s a lot like Dave Egger’s thing, just a different focus, ya know? We got a buddy who’s doin’ the same thing but combinin’ it with a little urban farm- there’s a crossover there too, ya know. DRDLM: Me parece increible. Eso de la combinacion de varios caminos o formas de operar y hacer una diferencia, contactarse y comunicarse con gente, y te deja ganar algo haciendo varios tipos de trabajo- me encanta. HWM: Exactly, sometimes when folks don’t want to build stuff or pay for studies in the landscape, we focus a bit more on bikes and bait. We don’t get rich, but we get through that down period. And all these different influences make the designs richer, brings together clients and users and educators and kids. And they give us a little space to experiment, to research. That’s something that we like to carry through in our designs- instead of fussy and precious forms and details, we focus on a sophisticated combination of real simple strategies, experiences, and materials. This brings about something rich and meaningful, but understandable. We really think that there’s some cool stuff going on in other landscape firms and there are tons of good ideas and stuff, but what is really needed is a little “disruptive innovation“, like them folks makin’ computers always come up with. Most industries do that, in fact. But us designers, we’re real conservative when it comes to puttin’ into practice new ways of doin’ stuff. So our disruptive innovation focused on fun, though I reckon it could be focused on anything like cost or whatever. But we think a big part of the idea of landscape should be “fun”; the landscape should be fun workin’ on it, bein’ in it, designin’ it, passin’ through it. I mean, there’s a time to be serious, but there’s also a time to bike to the fishin’ hole ’round the bend, wet a hook and crack a Bud. We wanta make that happen, too, and ya’ can’t if it’s all polluted or there’s no fish or no good way to get there. DRDLM: Increible. Me encanta como van desarollando esa idea. Ojala que influya la comunidad y que puedan seguir ganando una vida asi, para que puedan continuar con ese trabajo. La ultima cosa que espero entender mejor tiene que ver con el nombre de Lucha Libre Landscape. Por que eligieron ese nombre? HWM: LuchaLibreLandscape? Well, it don’t mean much. Mostly we just like it and it’s catchy. We do have a kinda weird fascination with the luchadores. You know, it’s always fun going to them matches and such. They kinda act out different stories and cultural myths as miniature story lines, plus it’s just entertainin’. 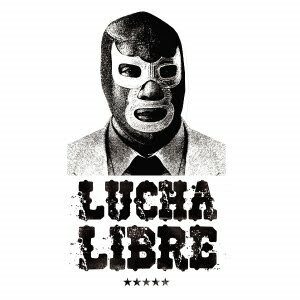 Another cool thing is that the name- lucha libre– means “free fightin'” meanin’ they use lots of different tactics and stuff, real versatile moves, no rules; which we like as a metaphor for our approach to designin’ things. Plus, there’s some nice alliteration. We don’t read a lot so we still kinda fall for things like alliteration. 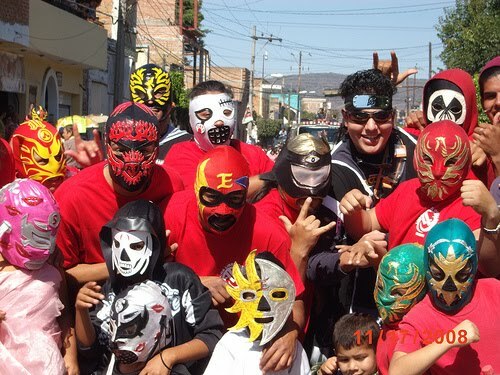 We might start carryin’ a line of lucha libre masks too, or maybe some bike helmets painted like ’em. While H. Willis and DRDLM couldn’t be more different, they do share a profound optimism in the landscape and our ability to shape it, and an abiding love for Lucha Libre, evidently. We love the ideas LLL is pursuing and the way they are working. 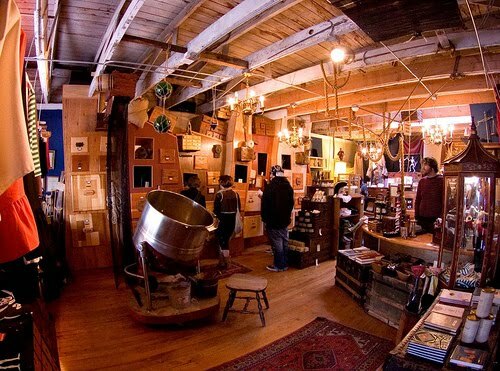 It’s like a love child of Tom Leader Studio and 826 Valencia and we are thrilled they’re out there. The thing that seems most interesting about this is that it suggests possible future funding models. Or maybe not future ones, but at least another way to pay the bills. Sort of like a creative worker loft mixed with tool-house. ha. yes, nam, exactly. i think there are ways we can incorporate fun, education, experimentation, and contemporary theories into landscape practice. and fishing.thanks for the input.